I'm on a one-way trip from Florida back to NYC, taking advantage of rental car specials that get vehicles back to the Northeast in time for the summer. The purpose of the trip was to see a game in Augusta and thus maintain my ability to boast of having seen a game in all 160 active minor league ballparks. With that done, the rest of the drive back with my family is more about seeing things other than sports, such as national parks and historic sites. But if there happens to be a game in a city I am in, I will stop by. 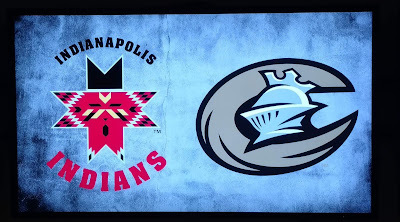 Such was the case in Charlotte on Friday night, as the Knights were hosting the Indianapolis Indians. 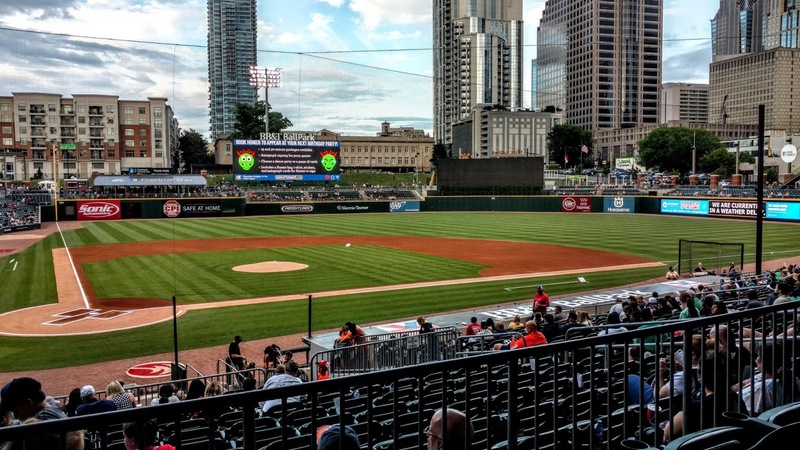 The game was scheduled to start at 7:04, and I headed downtown a little bit early to enjoy some of the atmosphere of race weekend, as NASCAR was holding the Coca-Cola 600 on Sunday at Charlotte Motor Speedway. After a brief visit to a local pub, I went over to the ballpark just before first pitch. The weather was good, so I didn't bother checking any social media to see if the game was delayed. Big mistake. Upon entering the ballpark, I was greeted by the below sight. Note the sign in the fence. Yep, a weather delay. 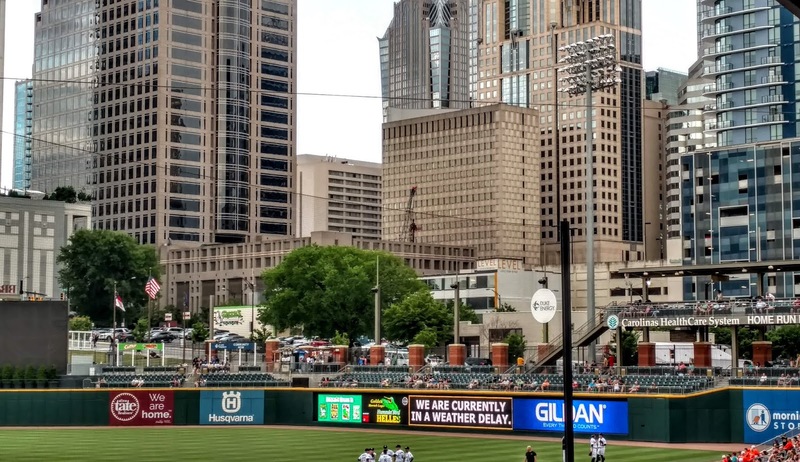 A more appropriate description would be a radar delay, as the weather in the immediate vicinity of the ballpark was quite nice. Patches of blue were apparent beyond the skyline but the delay continued past the rescheduled start time of 7:40. There were some dark clouds at one point, and a few drops fell, but nothing that would have caused the game to stop, had it started. There was even a rainbow in the distance, but no rain. Fans stayed because it was fireworks night, which probably helped the Knights coffers with 90 more minutes of food and drink consumed. 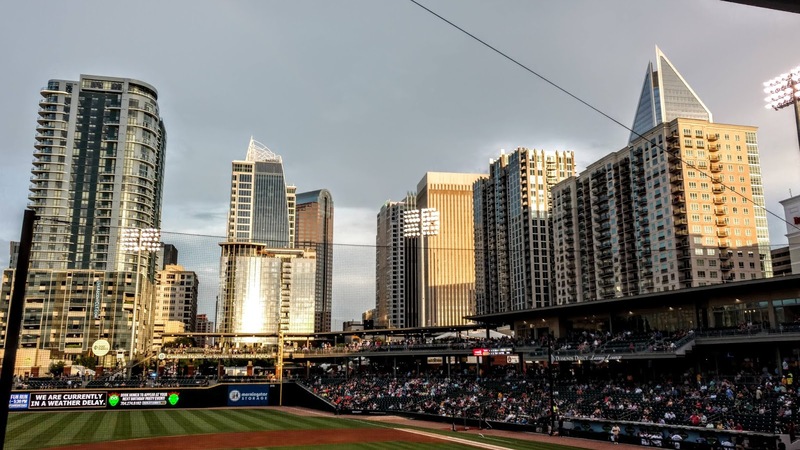 The only positive for me from the delay was the opportunity to take pictures of the spectacular Charlotte skyline, which is really the only reason to post this. 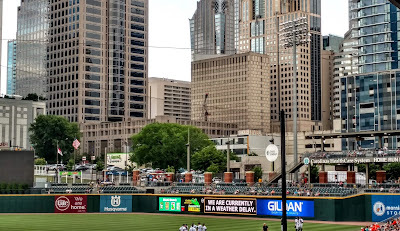 As I visited here 2015 (for the same matchup coincidentally), I won't bother discussing the ballpark, but it is interesting to see the changes in the skyline in just three years. 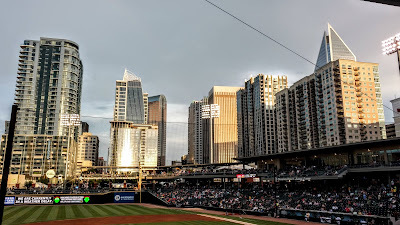 Anyway, the threat of rain finally passed and the game started at 8:25, with recent demotee Carson Fulmer starting for Charlotte (White Sox) against Nick Kingham for Indy (Pirates), who made history by retiring the first 20 batters he faced in his MLB debut back in April. Fulmer was wild and walked 6 in five frames, but none of them came around to score, while Kingham was taken out after one inning as he might start for Pittsburgh on Tuesday. 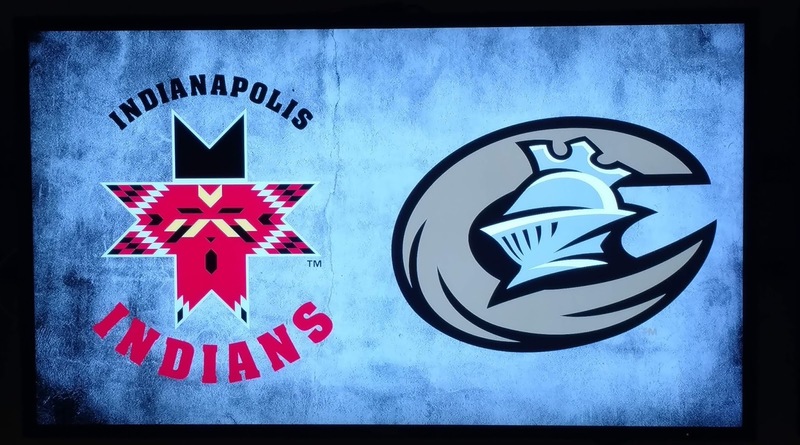 The Indians opened the scoring in the 4th when Jordan Luplow doubled, was sacrificed to third, and came home on a wild pitch. 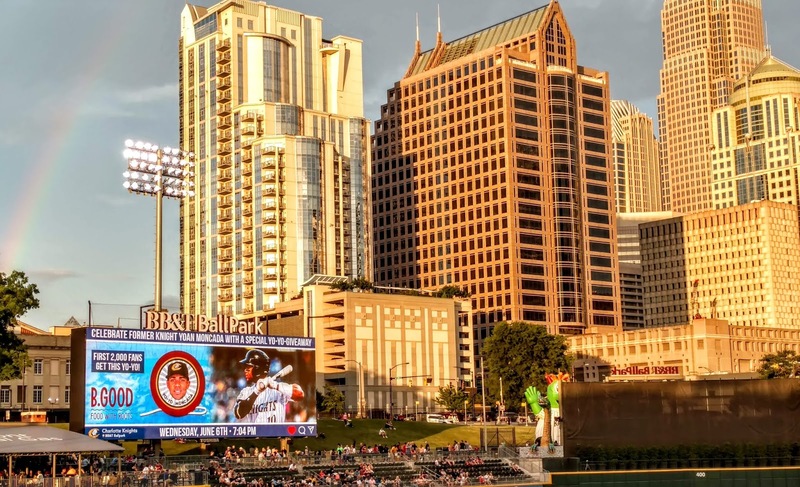 Charlotte managed two in the bottom half after Alex Presley reached on an error, Patrick Leonard tripled, and Mason Robbins added an infield single. And that was it. The bullpens chucked zeros the rest of the way. Casey Sadler was the hard luck loser having given up no earned runs, while Tyler Danish pitched 3 strong innings in relief of Fulmer, with Rob Scahill picking up the save. Despite all the walks, the game took only 2:29, a nice change from some of the 3+ hour affairs in the majors. I wish it had started on time, or that I had been smart enough to check their Twitter feed so I didn't have to stand around for 90 minutes. Next time, I'll be checking social media regardless of the weather.